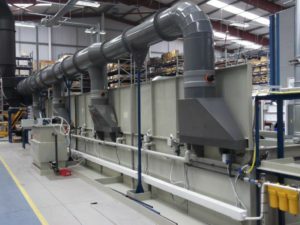 We have been designing and manufacturing fume extraction systems since 1956, so we can give you complete peace of mind that our systems will not only provide a safe working environment for staff but will also protect from corrosion risk from fumes. 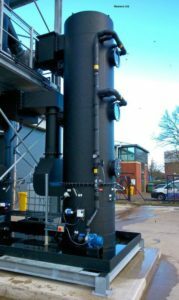 Our range of fume extract and scrubbing equipment is constructed from either PVC, polypropylene, PVC/GRP or Celmar/GRP dependent upon the chemicals being extracted ensuring low maintenance under demanding conditions. 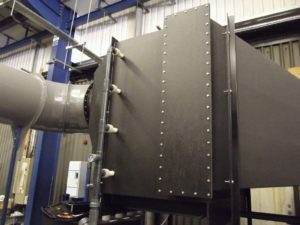 All of our units conform to current emission limits and can be constructed in a range of shapes and sizes to be incorporated into the extract system prior to the fan unit. 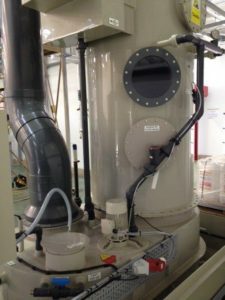 The base section of the scrubber unit forms the re-circulation tank and is fitted with a pump/s and seals to suit the application along with service connectors. A typical scrubber can run on water alone or a reagent solution of acid or alkali. Contaminated fumes enter the scrubber unit just above the base section and continue upwards through a packed section/s of pall rings where they are wetted by a particular droplet spray system of extremely fine droplets. The fumes then carry on upwards through a second packed section of pall rings before being wetted by a larger droplet mist. The fitting of a mist eliminator prior to the fan unit prevents moisture carry over. Mist eliminators are used for the removal of moisture from the exhaust fumes. We can incorporate these on a new project or as an addition to an existing system. They can be constructed from PVC, polypropylene, PVC/GRP or Celmar/GRP. The eliminator blades are constructed from polypropylene and installed as either a single or double bank and are positioned at the appropriate centres for efficiency. To further our commitment to the environment we also take noise pollution very seriously. Therefore our range of products can be fitted with silencers, allowing 24 hour operation and use in residential areas or environments sensitive to noise levels. Silencer units can be constructed from PVC, polypropylene , PVC/GRP or Celmar/GRP and fitted with suitable sound proofing material. Our silencer units are usually flanged for easy installation or removal. We can fabricate any shape as long as the air flow rate is not compromised. 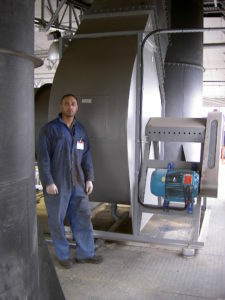 With our fans, fume scrubbers and silencers in place all that remains is connecting pipe and ductwork. We have many years of experience with design, construction and installation work in all materials.